Wanamaker was a successful Philadelphia merchant who pioneered the development of department stores. For many years John Wanamaker & Company was one of the largest department stores in the U.S. His paternalistic attitude towards his employees made his company an early leader in employee benefits. Benjamin Harrison appointed Wanamaker postmaster general in recognition of Wanamaker's contributions to Harrison's election. As postmaster general, Wanamaker advocated numerous services that were later adopted. Always very religious, Wanamaker contributed heavily to churches throughout his lifetime. John Wanamaker. ANS. 1pp. 8" x 13". Philadelphia. Nov 13, 1899. 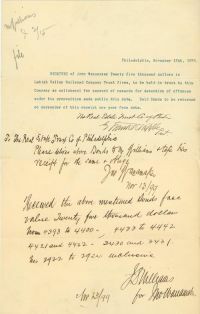 An autograph note signed by famed merchant John Wanamaker that states: "To The Real Estate Trust Co of Philadelphia Please deliver above Bonds to Mr. Williams & take his receipt for the same & Oblige Jno Wanamaker". There is a typed statement above: "RECEIVED of John Wanamaker Twenty five thousand dollars in Lehigh Valley Railroad Company Trust fives, to be held in trust by this Company as collateral for payment of rewards for detection of offences under his proposition made public this date. Said Bonds to be returned on surrender of this receipt one year from date." The document is in very fine condition overall.